In the course of the latest peaceful demonstration to support advocacy for West Papuans, 89 people have been arrested by the Indonesian police. On 18 September, one day before the actual rally, 21 of them had been already detained after distributing leaflets, leading to the gathering of around 200 people outside the local police station. During yesterday’s peaceful demonstration, involving thousands of participants, 68 additional protesters were arrested. During the last months several public demonstrations have been held by West Papuans demanding their right of self-determination. Thousands of people have rallied across West Papua this week demanding independence and their right to self-determination. The Free West Papua Campaign (FWPC) stated those that took part in the peaceful demonstrations marched with a clear message: “We want to be free people”. 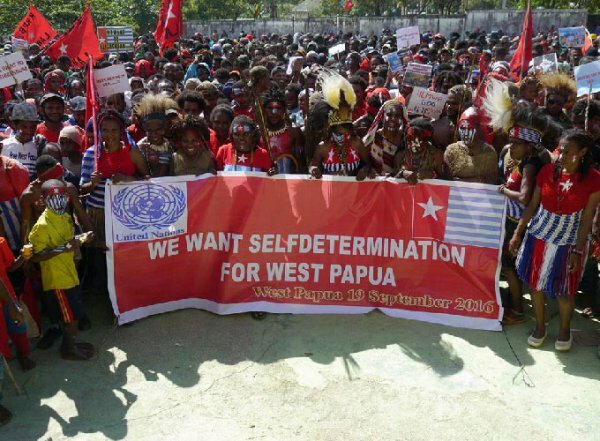 People of West Papua are calling on the United Nations to support their fundamental right to self-determination and a resolution for an internationally supervised vote for independence. FWPC reported that some demonstrations around the country were blocked by the Indonesian police and 68 peaceful protestors were arrested in Merauke, West Papua. A day before the demonstrations 21 women, men and children were arrested for distributing leaflets for the rally. Last week West Papuan leader Benny Wenda, who lives exiled in London, was interviewed by TeleSUR on ‘West Papua’s forgotten struggle for independence’. In the interview Wenda said people in West Papua sacrifice their lives by protesting and Indonesia continues to get away with “impunity”. “Indonesia is able to massacre my people. Almost 500,000 men and women have been killed. While I’m speaking, there are arrests and intimidations and imprisonments still going on in West Papua,” Wenda said. He said the Indonesian government has banned journalists from entering the country for the past 50-years which is part of the reason West Papua’s struggle remains largely unknown. West Papuans are left to turn to social media to get their struggle out to the world.